Russian Hebraist, poet, and educator; born in Zhagory, government of Kovno, in 1809; died in St. Petersburg Sept. 12, 1889. He was the fourth son of Joseph Mandelstamm, a man of liberal and progressive views who had imbibed German ideas and collected German books during his business travels in Germany. Under the guidance of his father and older brothers Leon acquired a large amount of rabbinical and secular knowledge before he was fifteen years of age. He married while very young, and settled with his wife's parents in Keidany, government of Wilna; but his progressive thoughts and habits were considered heretical there, and he was compelled to divorce his wife after about six months of married life. Mandelstamm then resumed his studies with renewed vigor, and about 1832 went to Wilna with the intention of entering its university; but that institution being about to be transferred to Kiev, he entered the University of Moscow instead. He graduated as a "candidate" (bachelor) in philology from the University of St. Petersburg in 1844, being the first Jew in Russia to attain that honor. 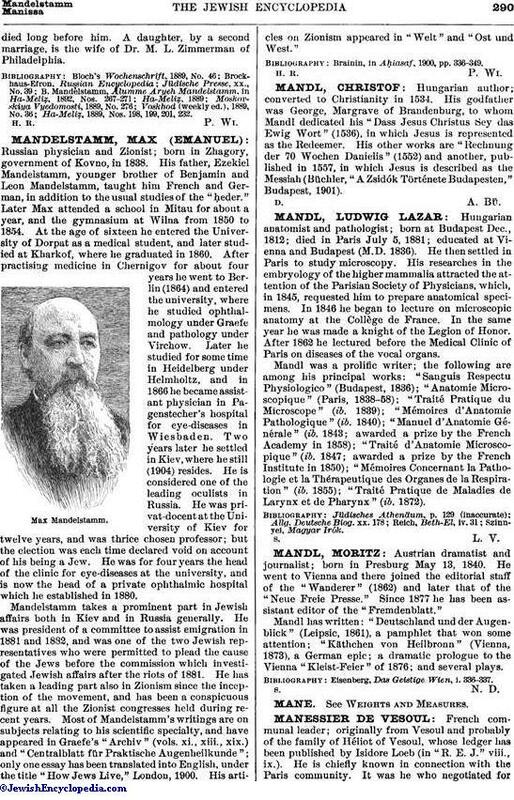 Mandelstamm acted as secretary to the rabbinical commission called at St. Petersburg in the summer of 1843 to draw up a system of education for the Jews of Russia. When Lilienthal, who had been selected to carry out the plans of the commission, or rather the plans of Uvarov, the Russian minister of public instruction, suddenly left Russia in 1845, Mandelstamm was appointed in his place and served under Uvarov and his successors until he retired in 1857. In these twelve years he wrote, edited, and published various books for use in Jewish schools, superintended the establishment of schools in various localities, including the rabbinical schools of Wilna and Jitomir, and appointed teachers for them (see Gottlober in "Ha-Maggid," xvii. 392). He had charge also of the disbursement of the candle-tax funds, which were for the purpose of supporting those schools; the conservative masses, hating both the tax and the purpose for which it was levied, saw in him the embodiment of all the evil of the new movement. The ill-feeling against him disappeared in later years (see Gurland in "Ha-Shaḥar," iv. 112). After his retirement from the service of the government he engaged in various financial enterprises, but few of which were successful. He spent much time in Germany, especially in Berlin, where most of his works were published. His Russian translation of the Bible was at first prohibited in Russia, and was permitted later only on condition that it would not be sold without the Hebrew text ("Allg. Zeit. des Jud." 1870, pp. 438-439; ib. 1871, p. 340). His last years were spent in poverty and neglect. Having died suddenly on a ferry-boat, he was buried in a pauper's grave; several days afterward, however, he was disinterred and buried with proper honors in the Jewish cemetery of St. Petersburg. His library was taken to the United States by A. M. Bank and was sold to the New York Public Library, where it formed the nucleus of the Jewish department of that institution. 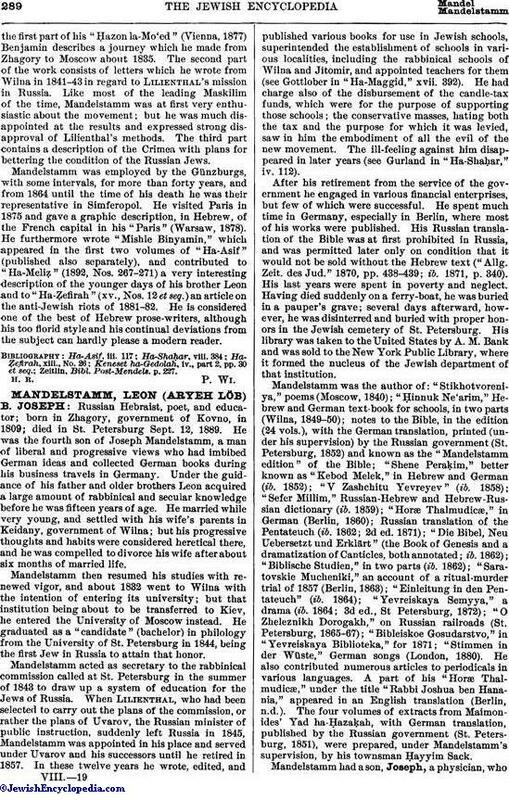 Mandelstamm was the author of: "Stikhotvoreniya," poems (Moscow, 1840); "Ḥinnuk Ne'arim," Hebrew and German text-book for schools, in two parts (Wilna, 1849-50); notes to the Bible, in the edition (24 vols. ), with the German translation, printed (under his supervision) by the Russian government (St. Petersburg, 1852) and known as the "Mandelstamm edition" of the Bible; "Shene Peraḳim," better known as "Kebod Melek," in Hebrew and German (ib. 1852); "V Zashchitu Yevreyev" (ib. 1858); "Sefer Millim," Russian-Hebrew and Hebrew-Russian dictionary (ib. 1859); "Horæ Thalmudicæ," in German (Berlin, 1860); Russian translation of the Pentateuch (ib. 1862; 2d ed. 1871); "Die Bibel, Neu Uebersetzt und Erklärt" (the Book of Genesis and a dramatization of Canticles, both annotated; ib. 1862); Biblische Studien," in two parts (ib. 1862); "Saratovskie Mucheniki," an account of a ritual-murder trial of 1857 (Berlin, 1863); "Einleitung in den Pentateuch" (ib. 1864); "Yevreiskaya Semyya," a drama (ib. 1864; 3d ed., St Petersburg, 1872); "O Zheleznikh Dorogakh," on Russian railroads (St. Petersburg, 1865-67); "Bibleiskoe Gosudarstvo," in "Yevreiskaya Biblioteka," for 1871; "Stimmen in der Wüste,' German songs (London, 1880). He also contributed numerous articles to periodicals in various languages. A part of his "Horæ Thalmudicæ," under the title "Rabbi Joshua ben Hanania," appeared in an English translation (Berlin, n.d.). The four volumes of extracts from Maimonides' Yad ha-ḤazaḲah, with German translation, published by the Russian government (St. Petersburg, 1851), were prepared, under Mandelstamm's supervision, by his townsman Ḥayyim Sack. Mandelstamm had a son, Joseph, a physician, whodied long before him. A daughter, by a second marriage, is the wife of Dr. M. L. Zimmerman of Philadelphia. Ha-Meliẓ, 1889, Nos. 198, 199, 201, 232.